Years ago, Canadian-Trinidadian artist Talwst (née Curtis Santiago) was challenged by a Parisian flea market vendor to transform an old ring box into a piece of art. 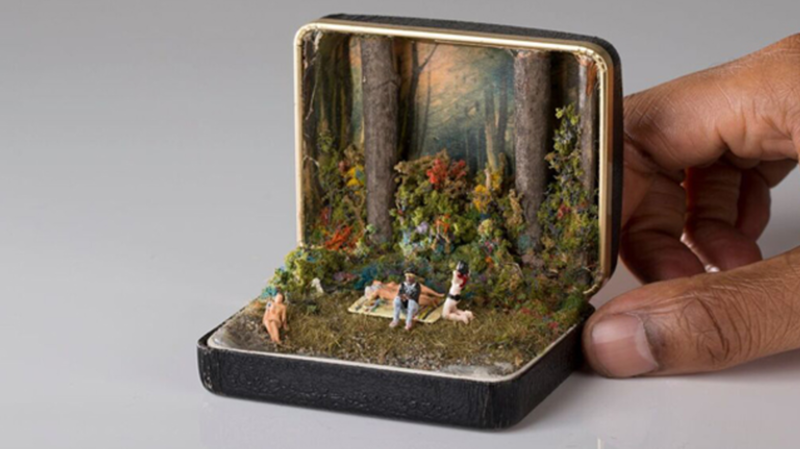 According to The Guardian, Talwst fashioned a tiny diorama of a woman bathing in the ocean. This work inspired him to create an ongoing series of small-scale landscapes inside reclaimed jewelry cases. Talwst collects the discarded boxes from fans, antique stores, and online marketplaces. The CBC writes that his minute scenes are inspired by pop culture, current events, and art history, as well as his own memories. Check out a few of Talwst's fanciful creations below, or visit his website and Instagram account for more information on the Toronto-based mixed media artist. All images courtesy of Talwst.